They're quite rare, nowadays, but there we go. If Apple could get their act together, I could've said "Y2:W48 : Cardagain iPod", but.. guess that's not happening any time soon. Nearly a whole week since I submitted my game, and still no feedback at all. Or, rather, I've nothing planned at all. It's Sunday morning, I've not started a game and I have no ideas. ... or at least, nothing that can be done in the next few hours, anyway. Maybe I will, maybe I won't, but I probably won't. I already said the other day that I'd be taking this week off, to handle all the Highscore stuff, but that idea kinda exploded in size, in my head, and is now (probably) going to take a lot longer than planned. Stupid ideas, need to put a lock on my brain!! As well as that, I've been waiting around impatiently for Apple to approve/reject my app. It's not even got to the review stage yet, and I'm pretty damned sure that's the fault of Yankie-Doodle-Doofus who went and stuck a Tether in his App. .. You've gone and fucked up the whole App-Review process for everyone, so THANKS FOR THAT!!! But I'm still ahead, so we're ok, right? Although, I did say that last week, too! Looking at the stats, either everyone decided to leave when I released NeonPlat (Why?!) or folk started to get upset when I mentioned my attempts at iPhing Development. I'm not sure which, but there's certainly been an awkward shift. So, I'm going to split things up. 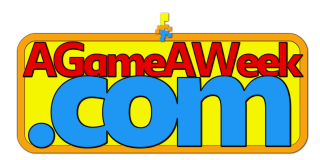 Even though my iPod Development won't be "AGameAWeek" (or at least, not for a long long while) I've still decided to call my new site AGameAWeek iDev. Because, what the heck, that's my brand now! I might as well stick with it, right?! This week's game came out a whole lot better than I'd expected it to. It's still not fantastic, but given that the game only just started to fall into place yesterday, it's not turned out so bad. 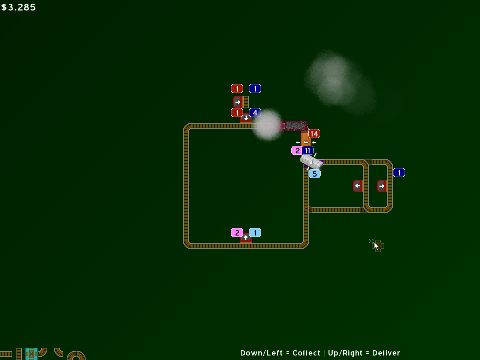 Keep the train looping around, whilst collecting and delivering everything needed. 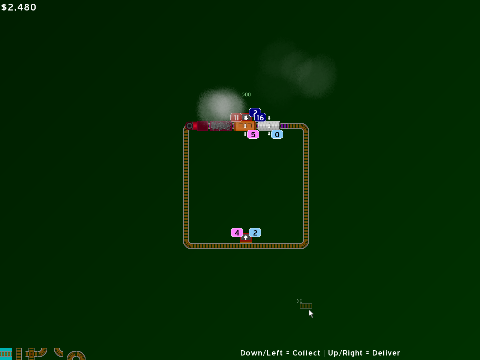 Still no name for the train game, so it's currently named "Jay's Train Game"! silly name! It's a bit more gamey, now. Some sort of cross between a proper sim-type thing, and a cheap arcade game! Odd. Needs a few more "This is happening" type notifications, but it's all falling into place. No idea if it'll all be done by the morning, but it's closer than it was yesterday, and it feels a lot more like I've bothered to plan it out!!! Will it be fun? Only time will tell! 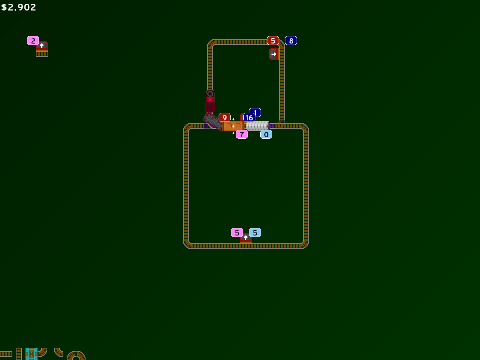 This week I've drawn a train, and some tracks, and am currently in the midst of desperately trying to get the train to behave upon said tracks. So far, it's a stuggle! Trying to get each carriage to turn at the right time, trying to account for the 30-odd track pieces that I've drawn, and trying not to make it look rubbish. meh, what can you do! It looks a wee bit unrealistic, but it gets the job done! 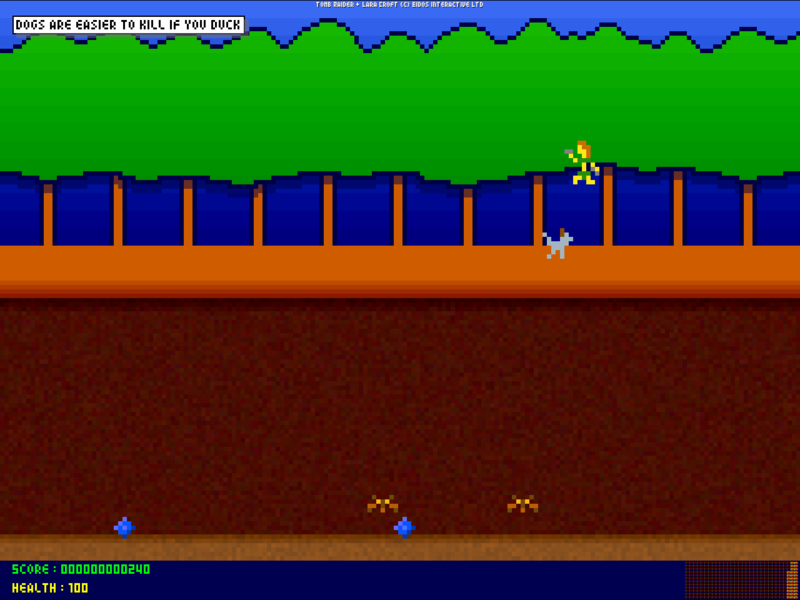 The engine is piecing together slowly, and I've yet to consider any sort of gameplay. Whether or not this all falls into place within the next day or so, is entirely up to how much I refrain from doing silly things on the internet, like typing large blog entries like this one. Perhaps Tuesday : A new game, with a steam train, but with no name. Not quite the 200 I was hoping for when I asked for levels the other week. 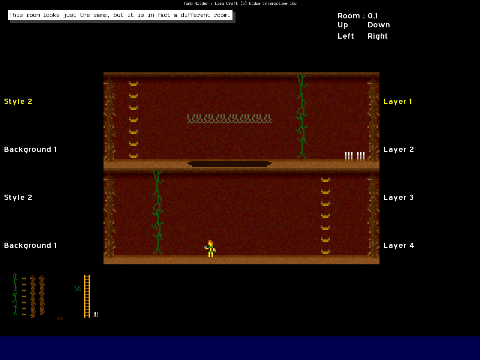 Still, Shadow1w2 sent us 10 whole new fun mean levels to play with. Meanwhile, I've been so busy with everything else that I hadn't much time to make any, so you'll have to make do with only 7 little levels that I made this morning! eek! I made this about 4 or 5 days ago, and have had it as my desktop on about 3 different systems. There's a game-logic-error in the thing, but other than that it's a nice looking desktop. 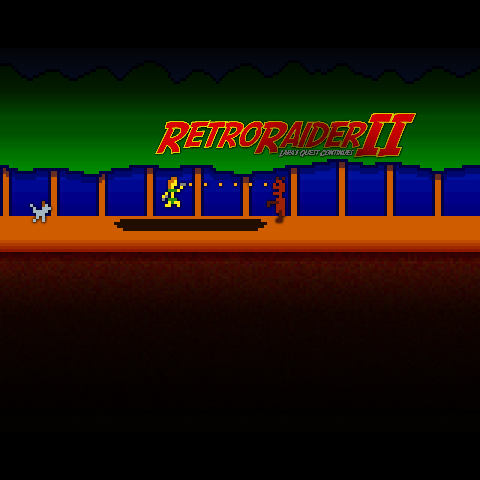 It's a massive 3200x3200 pixels, but should scale nicely to your resolution... If not, feel free to chop it down to size a little! Is it really 200, already?! Blimey! The quickly made retrospective "look at what you've done" post.. 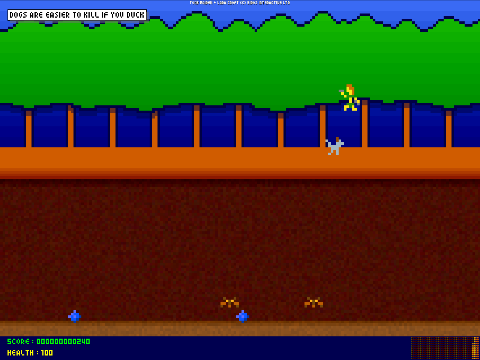 I started writing games as a kid, went through school making silly games, and ended up with not-much-at-all to show for it. 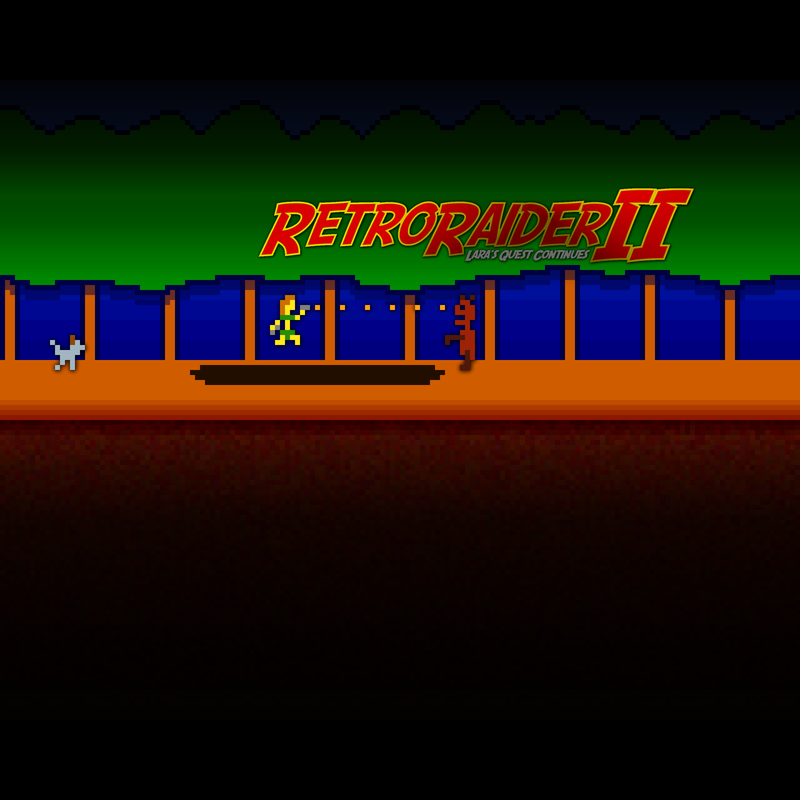 My super copyright infringing retro game is back! Take one part Pitfall, one part Tomb Raider, and mix in a little Indiana Jones, and this probably wouldn't be the first thing that springs to mind. You can play along inside the editor, just like in the last one, but things get a bit shrinkied this time. 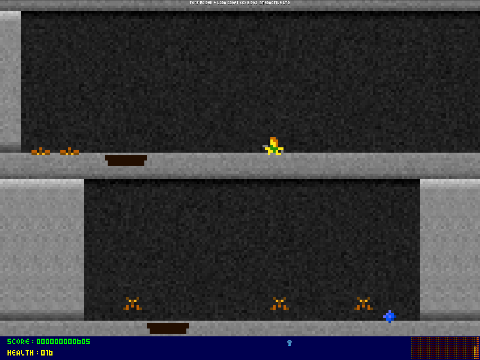 The game scales down from 7*pixels to 4*pixels, so that a bunch of extra editor clickables can fit around the side. There's not a whole lot of clickables, right now, but it's all a WIP. The levels then save as nice neat XML files, so you can even set about tweaking them in notepad, if you feel the need! Nothing else to show, right now.. Looks/feels about the same as it did before!! Oh, and those "Layer" things are so you can have holes with gripable vines, or dogs starting off at the same place as gems, or whatever.. together... rather than only having one object per "block". 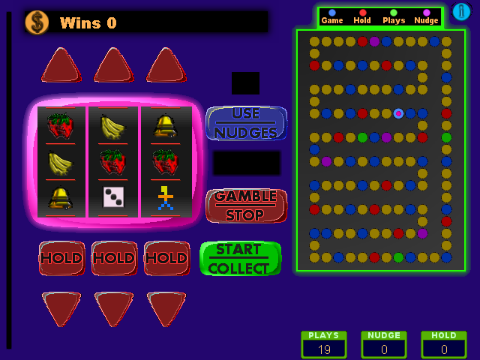 The people at Curly's World of Freeware suggested that the original Microbes game might've been a wee bit too crazy. Sorry, CWFers, this one's takes the crazy up a notch!! actually, there's not really a whole lot more to it than that! 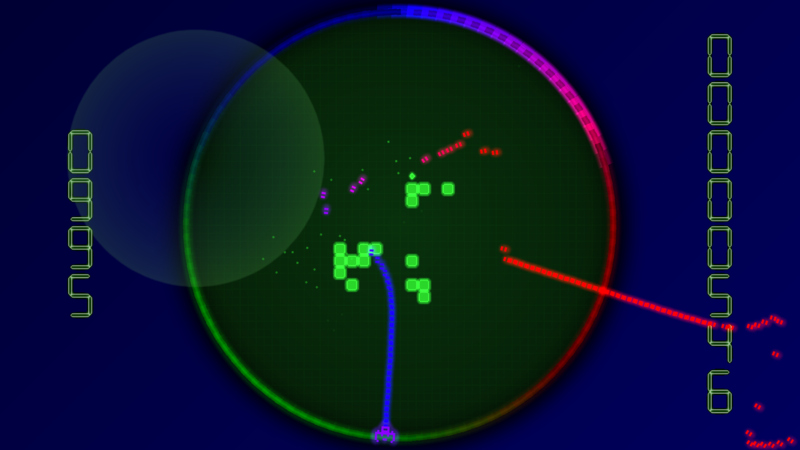 This is the original Microbes, with a little bit more, but rewritten to be smoother, and to run on Win/Mac/Lin! Enjoy it, it's a great little shooter! You can Download MICROBE2 from The Jayenkai Archive for Windows, MacOSX and Linux. AGAW Scoring : 45 weeks, 46 games.. and much better this week! I just spent the past two hours trying to get my iPod game to pause when the user quits via Multitasking, or by the lock button, or whatever. Trying to pass a variable (a single little integer) from one part of the program (AppDelegate) to another (ViewController) is probably one of the most difficult things I've ever had to do! Good God, why do they have to make things so damn difficult!? Used to work fine for me!?!! It works now, and I'm pretty sure it'll do most cases. I'm not 100% sure what happens when the user gets a phone call, since.. um.. Can't find that option in the Simulator. I can get it to show a status bar, but not go "YOU GETS AN PHONE CALL!!!!! ", so.. um.. thanks for THAT, Apple! tsk..
Keep the disease at bay! The plan was as follows..
A couple of little piddly games to tide me over. Spent too much time on Remakes, releasing remakes instead!! A great little remake with.. um.. powerups are thus far about as interesting as it gets! iPhing Dev Day, um... dunno! Hmm.. This iPhing dev is taking longer than my regular AGameAWeek stuff! But I'm learning, and I'm practising, and I'm breaking and fixing things, too! Today I got loading and saving to work, I got most of my menu working, and I even got the pause button going, too! I've popped in the regular "Platdude Jingle", figured it'd do for the meantime, and..
Well, it's looking and feeling much more like a game, now. The code is absolutely ghastly, mind, but that can be sorted. I still need to do the following..
3. Badges? Might be interesting to add them somewhere. Um.. #4 is the bit I'm dreading, but will probably turn out to be the easiest! No video today, there's not really much more to see than what was in the last clip. But, o/ yeay o/, game!! !